Yeah, big whoop he did it. To the packed grandstands clung an air of charmless inevitability, Sebastian Vettel became the youngest double champion, as if we didn’t already know that was going to happen. Let’s be honest, we knew as soon as he hit the track in Australia that something was up, his almost unrivaled dominance over the season culminated in a surprisingly muted radio transmission and celebration. They say you can never recapture that feeling of winning your first championship (we’ll have to take the word of those who have that rare and cherished memory), and what we saw from Vettel confirmed that, although the back to back race with Korea put paid to days of partying. 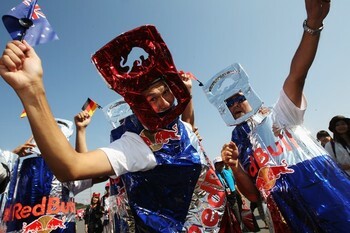 However covert operatives have leaked reports that a rousing session of karaoke (when in Rome…Japan) occurred with Vettel giving his rendition of Yellow Submarine by The Beatles and Combine Harvester by The Wurzels for Christian Horner. Questionable music choices aside (Big Bad Wolf included, tsk tsk Red Bull), the race itself was interesting enough to make up for the disappointing qualifying session (lazy drivers in Q3) and inevitable result on race day (did I mention he did it?). So to the start, Webber had a bad one, Vettel streaked off into the distance, Alonso mastered it, Liuzzi played skittles… Would you believe it, none of that happened. Webber had the first non-heart attack inducing start in some time, he pulled away in an average fashion and kept his position. Yeah, not one place lost, despite a tough seeing to from Schumacher. Vettel however, had been kneeling at the Schumacher alter and took a leaf out his extensive bible to force Button to sump two wheels onto the grass. 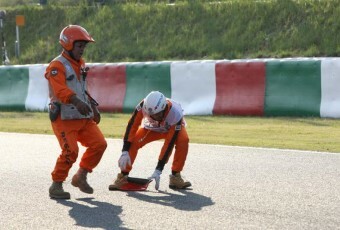 Hamilton benefitted, but it didn’t make much difference come the end. It was Kobayashi that stole the limelight with the second worst start (Liuzzi wins that) of the season, bogging down so much you would have thought Webber had licked his wheels. With tyre degradation so bad, the majority of the overtaking was done through the pit stop periods, and a conservative approach from Red Bull gifted others to take righteous advantage as they wanted to get their new champ to the line in one piece. So with this in mind it was the cars of Button and Alonso that were released to push each other, we knew McLaren had the speed all weekend so the pace produced by Ferrari was pleasantly received by almost everyone. Vettel wanted that win, but a cautious radio call from his pit wall put paid to a final charge on Alonso, ‘take no risks’ was the mantra, one that Webber was forced to listen to as well. Even though the Australian was catching the German at some pace towards the latter stages. The Bulls may have cruised to the finish line, but a safety car period triggered by Hamilton and Massa cosying up to each other again. Yes, the Brit and the Brazilian couldn’t resist getting fresh. A little touching here and there saw Massa lose part of his front wing, adding yet more fuel to the Latin Hamilton-Hatin’ fire that burns within him. Hamilton later said that he couldn’t see out of his mirrors due to them being a bit too wobbly, funny how he reveals this with a handful of races to go. Even funnier that Whitmarshis pledging to find a solution to something only one driver has a problem with. The marshalls obviously decided they didn’t want to get involved with the Hamilton/Massa war, and when they saw Webber and Schumacher bump into each other they called up the safety car on lap 24. This added another dimension to the Japanese Grand Prix by bunching the cars and giving the screaming tyres a break, without the arguably unnecessary break Button may have never made it to the line (even though he pulled up just after securing his third win). So it may not have been a nail biter, but it lifted the lid on what we could be privy to in the last four races of the season. Ferrari and McLaren could push the constructors’ title further than anticipated, though who could see it going anywhere else but Red Bull? It would be richly deserved by a team who have yet to put a foot truly wrong with strategy and design this season, they have known exactly what to do to get the right result all year. But did you see Vettel struggle a wee bit in traffic? He was clearly annoyed by being launched into traffic after a pit stop, something he’s rarely experienced in 2011 and something non-Vettelian fans will probably want to see happen more often. The grandstands were packed from Thursday onwards, and presented the drivers with voracious admiration and adulation as they brought the media to Japan to witness a positive global event. Even Bernie Ecclestone got in on the goodwill by getting puppets manufactured with profits going to charity, and giving tickets away to tsunami victims. Also worth noting is that Schumacher led a lap! 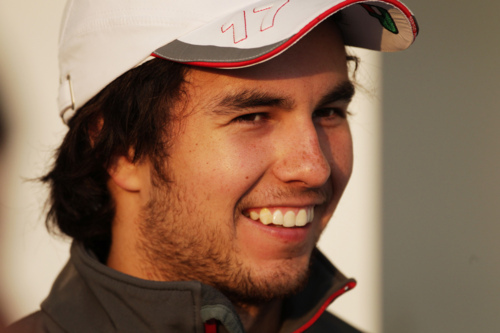 Petrov did his best to retain his seat for 2012, and Perez had a quiet yet productive day. Rosberg also did well despite a last row start, and got himself into the points. Yes, we knew that was going to happen. 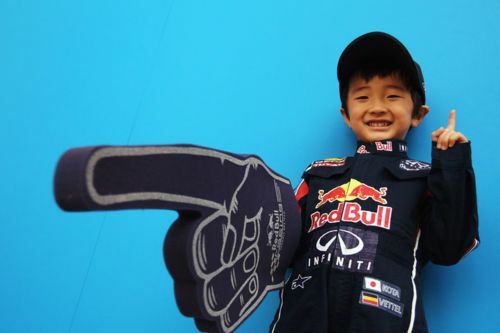 But massive and well earned congratulations to Sebastian Vettel. It was a title that he worked hard for, one he was determined to win and, one he never compromised himself to do so. 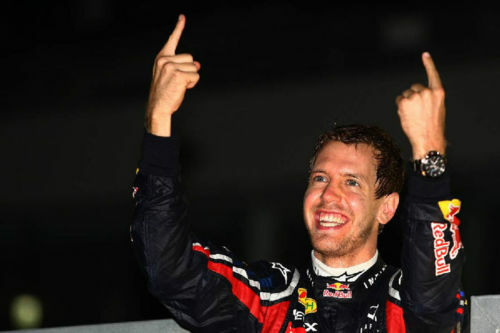 So cheers to you Mr Vettel! Just next time take it to the last race, because it’s all about P2 now. Retirements: Buemi (11) – wheel came loose. Jenson Button will you ever have a bad race? Other drivers may beat him to the punch here, but one thing Mr Button has proven this year (along with a certain double champ) is that he can turn up to any venue and perform consistently regardless of the conditions. In fact, the worse they are the better he does, but aside from that he’s set to become the first F1 driver to outscore Lewis Hamilton since the wonder Brit joined the grid in 2007. Question is, will he get the higher number, surely the number 3 car next year? Or if McLaren get their skates on…something a little higher. As we hurtle towards the last remaining races only two teams have a chance of putting their drivers in the face saving second place, apart from Red Bull. McLaren and Ferrari both threw down a gauntlet this weekend, McLaren were undoubtedly worthy winners with outright pace from Friday morning onwards. But Alonso was the surprise podium occupier, and gives hope for the last four races of the year being more interesting (championship-wise) than the season so far. Quietly getting on with it is his mantra, and yet again Sergio Perez befuddled the field by visiting the pit lane less and benefitting on track more than others. Being light on his feet helps, and so does qualifying 17th, following Jaime Alguersuari and his ‘points from 18th’ example. Plus he had a touch of the same rookie flu di Resta was battling with. Most of the overtaking was played out in the pits during the race, and the brilliant strategy gifted to Button allowed him to fly at the front at the most important time. This is not to say we were completely devoid of exciting overtaking moments, there just wasn’t the one stand out pass that wowed the crowds. “He’s got to get a penalty for that, hasn’t he? He’s got to get a penalty for that.” Button after his Schumacher flashback with Vettel after the start. “Vettel has been told not to take any risks with Alonso. You should do the same please. 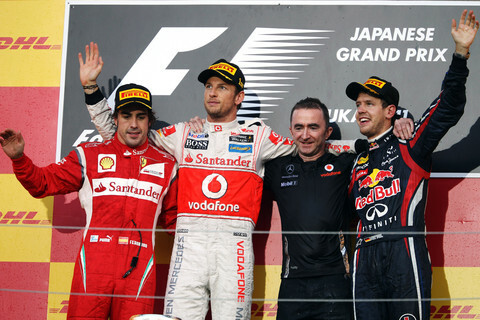 No risk ahead.” Pilbeam to Webber, translation: Pretty please with a cherry on top don’t bump the champ off the podium. “I tried get close to Fernando. I lost connection a little bit after the back-marker we had to past. I think it’s one of the Virgins. Not many ‘virgins’ in Formula 1 but anyways. Sorry.” Vettel showing that even champions have a filthy mind.